When it comes to the BA International Studies program, the third year first semester is where you have the most space for movement and choice. Until this point most classes were taken by all and the two choices you made so far were your area and language. (Ex: Latin America and Spanish in my case) But the third year with its discretionary space is when you actually get to shape your semester and year. The discretionary space allows you to choose between going on exchange, finding an internship or doing a minor. I personally chose doing a minor here at Leiden University since I was already abroad and settled (and of course I had classes to retake so I had to stay but shhh…) Thus this post is shaped around my experience and doesn’t apply to all third years in their first semester. So, what’s it like to be a third year in the first semester (in Holland)? You will see the incoming first years, all excited and not knowing what to expect. So joyful, full of energy, dedicated to studying and partying… Wherever there’s an event, they will be there. Seminar on inequality? Yes! Drinks for Peace? Yes! In my first year during this course, there wasn’t a pub crawl during intro days but in my second year, they organized one and I don’t even know how many pubs I had been to that night, how many people I met or how many of them I forgot by the morning after! Ps. I know this post doesn’t apply to people who were abroad, but I’ve been (lovingly) jealous of all the amazing photos you’ve been sending and the stories you’ve been telling so Im gonna ignore you for the purposes of this post. Ps. I love you (and am glad that you are back)! 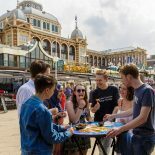 This entry was posted on March 27, 2016 by in Ecesu, Living in Holland, Student Life, Study, Uncategorized and tagged BAIS, Ecesu, Ecesu Erol, The Hague, third year.